Our mission is to engage communities in tree planting to cultivate a lasting legacy of environmental sustainability. We envisage a future where communities are inspired to implement natural solutions to climate change. We believe community activities, like Roots for the Future’s are at the root of curbing the global issue of climate change. Our one minute video shows one of our workshops in action. Roots for the Future was dreamt up by co-founders Francesca Fryer Rigden and Daniel Rigden. Francesca has spent many years working in international development and campaigning for progressive causes. Inspired by a work trip to Ethiopia where farming communities told her about the dramatic change in their climate over the last 20 years, and with the UK’s increase in flooding she decided she should focus more on environmental issues. 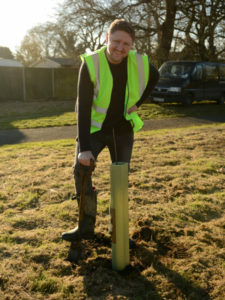 Her husband Dan has been a tree surgeon for two decades and plants trees as well as gives them a trim. 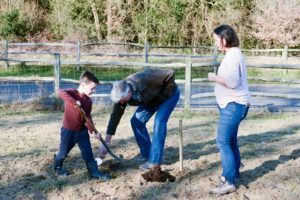 With the government’s sustainability targets and the universal sustainable development goals in mind, in 2016 Francesca and Dan founded community tree planting social enterprise, Roots for the Future. Suzanne has worked for 15 years in the third sector, focusing on environmental charities particularly around the issues of water resources and climate change which she studied at Imperial College. 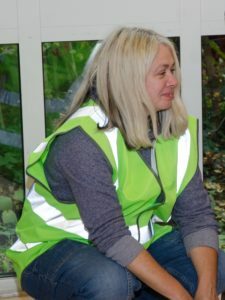 Protecting the environment has been her passion since she joined Friends of the Earth as a teenager in 1974 and as a lifelong campaigner against the slaughter of whales, she wears her heart on her sleeve which she has put to good use in raising millions of pounds for charities. Coming from a mixed background in CRM in the retail and not-for-profit sectors, Sam has a keen interest in equality and the environment. In addition he is proficient in event management, running music events, in particular our much loved local annual festival, Staycation Live. With 8 years experience of Operational Management within the Charity sector and a mum of 2 young boys, Tabitha is keen to use her skills to help Roots for the Future improve the local and wider environment. We bring people together to plant trees in their communities, encourage them to preserve and protect those trees, and to enjoy their benefits. We invite all ages to participate, and envisage that our involvement of children and young people will help to inspire the next generation to address climate change with environmental solutions. Trees are amazing. As we all learn in school, they give us the oxygen we breathe and it’s well known they absorb and store the carbon emitted from vehicles and industrial activity. They also mitigate other climate change related issues such as flooding. That’s because water sinks into soil under trees at 70 times the rate it sinks under grass. With so much on the news lately about our poor air quality, it is important to note that trees absorb pollution and filter particulates out of the air by trapping them on their leaves and bark. We aim to cultivate a lasting legacy of environmental sustainability by engaging communities in tree planting. We believe that participation in our workshops contribute to social integration at a local level. The workshops act as a call to action to enable people to do something positive together for the community as well as for the good of humanity. Green spaces make us feel better and more resilient to stress. Studies show that when people are recovering in hospital, if they can see a tree outside their window, they get better more quickly than those who can’t. And it is reported that trees cut crime and anti-social activity. 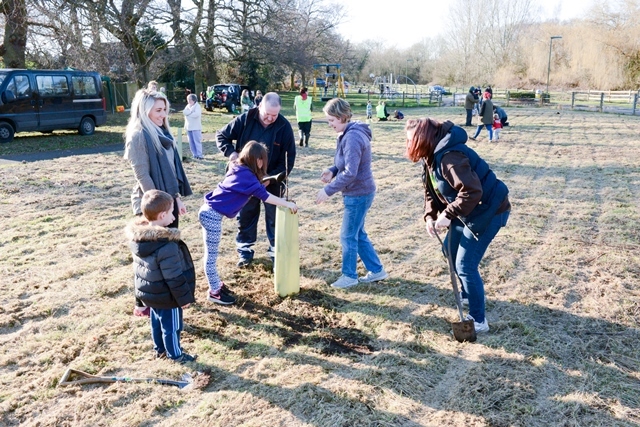 Protecting and enhancing local green space is critical for the health of people as well as the environment. According to Natural England, the government’s conservation advisor, green spaces close to home or school positively impact children’s body mass index, resilience to stress, and ability to learn. It has been shown that older people live longer in areas with more green space. People who visit the outdoors every day, take part in gardening, or are members of voluntary environmental organisations have higher feelings of happiness and well-being. So come plant with us!